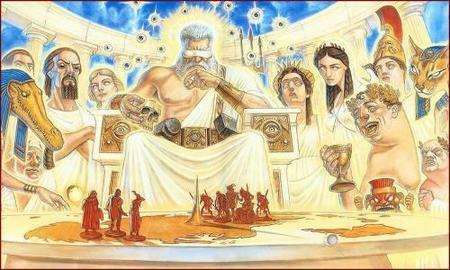 “I only invented the Discworld,” said Terry Pratchett, “Josh [Kirby] created it.” Kirby painted the exuberant, detail-filled covers of the Discworld books that gave the series an unmistakable visual identity, suggesting that there were multitudes of other stories happening on the Disc and that Pratchett just chose some of them to tell. His teeming figures, his illustrations’ multiple layers of action, their over-the-top liveliness certainly inform my view of Discworld as a place constantly in motion, with more taking place than any author, even one as prolific as Pratchett, could hope to capture. Kirby died in 2001. 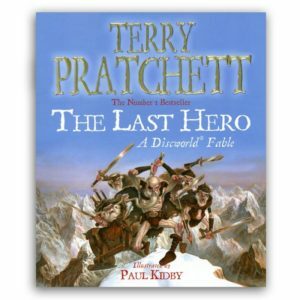 Paul Kidby (the similarity of their surnames is surely a coincidence) succeeded him, and The Last Hero was his debut. What a start! It’s not, strictly speaking, a graphic novel. Nevertheless, every page is illustrated; the whole book is printed in full color; numerous two-page spreads capture landscapes, characters and crucial parts of the action. 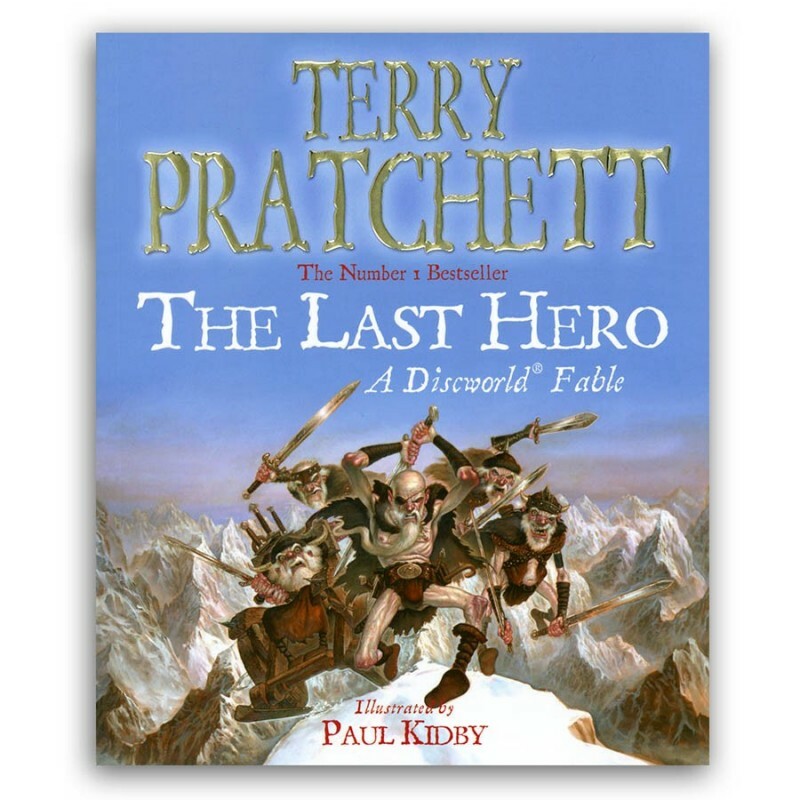 The Last Hero would be far slimmer, and far less satisfying, without Kidby’s illustrations. The story plays off of the legends of humanity’s first hero, the person (known by numerous names on different parts of the Disc) who stole the secret of fire from the gods. Cohen the Barbarian and his Silver Horde aim to become the last heroes by returning it. Fire, in this form, of a massive magical incendiary device which they will detonate in the middle of the gods’ abode, doing away with the gods and providing a suitable conclusion to Horde members’ careers as heroes. They have even specially recruited a singer to witness the events and write them down in a song that will be remembered forever, the only form of immortality that the heroes believe in. What they have not reckoned with, however, is that the force of the magical explosion in that particular place would be enough to destabilize the Disc itself, leading to its demise sooner rather than later. Minutes, actually. The Horde would not only be the last heroes, they would ensure that everyone on the Disc when they set off their device was the last of every kind. Word of the Horde’s mission has reached Lord Vetinari, Patrician of Ankh-Morpork. Unusually for a politician, he is quick to appreciate the consequences of a rapidly changing climate. Even more unusually, he has a house genius to hand — Leonard da Quirm — and so a plan rapidly coalesces for how to stop Cohen and the Horde. The plan involves Rincewind, the hapless, hopeless magician, but in this case it’s forgivable because Captain Carrot is also along for the ride, with Leonard in the driver’s seat and the Librarian as a stowaway who, in a nod to “The Cold Equations,” almost wrecks the mission before it can properly begin. “Is this the time to resign from the crew?” said Rincewind, staring at his fellow voyagers. He held Rincewind’s gaze for a moment. “I think there’s a catch there,” said the wizard, knowing he’d lost. “Yes. The best kind there is,” said the Patrician. Mostly, The Last Hero is fun. Cohen simultaneously fulfills and subverts conventional ideas of fantasy heroes. There’s a woman barbarian, Vena the Raven-Haired, now known as Mrs McGarry, but still more than a match for the band of robbers who attempt to ply their trade on her. There’s a Dark Lord (Harry) who always manages to get away. There’s the wizards of the Unseen University doubling as Mission Control. There’s a brief sojourn on the moon. There are some more serious thoughts about aging, about fate, about humanity, about stories and immortality, but they are asides, just as they should be in this instance. What people will remember is the story.